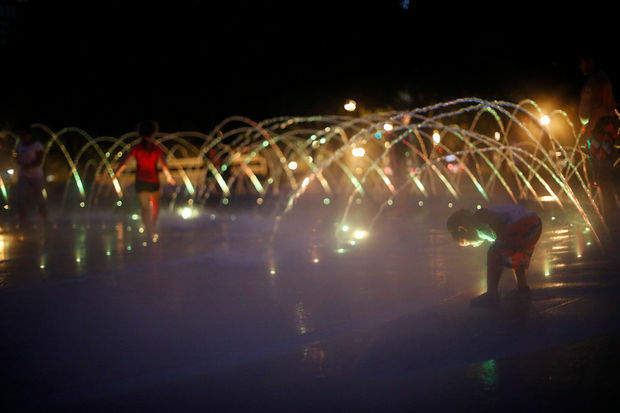 Children play in the fountain at Navy Pier's Polk Bros. Park. A new movie and live music series is coming to the park this summer. STREETERVILLE — Free weekly movies, live music and Shakespearean theater are all coming to Navy Pier's new park this summer, starting Monday night with a lakefront screening of "Sharknado." The festivities will usher in the debut of two new "performance lawns" at the Polk Bros. Park near the pier's entrance. "Sharknado" will be the first of eight "Water Flicks" playing every Monday night through Aug. 18 at the park. The performance lawns will cap off the new park, a $20 million gift that features a big water fountain at what was once the state's largest tourist attraction at 600 E. Grand Ave. (Millennium Park is now No. 1). 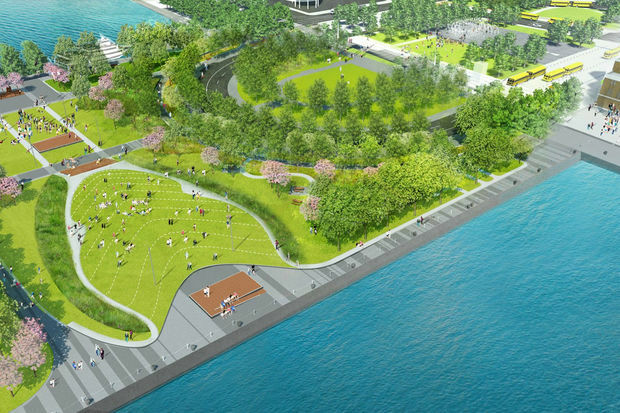 An aerial rendering of the "performance lawns" at Navy Pier's new Polk Bros. Park. The performance lawns on the park's southern end can accommodate more than 2,000 people and offer views of the city skyline and Lake Michigan. The lawns are latest addition to the pier, which is undergoing big changes in a bid to draw more visitors. The pier debuted a new Ferris wheel for its centennial last summer. The new performance lawns' debut "mark a significant moment in Navy Pier's history as we take the next step in our transformative journey to become a world-class public space and leading arts and cultural destination," Marilynn Gardner, Navy Pier's president and CEO, said in a statement. The "Sharknado" screening will precede a Navy Pier 101st anniversary party Saturday night with live music, swing dancing and a fireworks show. The lawns will also host the Chicago Latin Jazz Festival on July 16, a Tap Fest on July 19 and three free performances of "Romeo & Juliet" July 27-29, the pier said. Other planned changes coming to Navy Pier include a new hotel with rooftop bar and a "lake overlook" jutting into Lake Michigan off the pier's eastern end. Aug. 14: "Beach Blanket Bingo"
•Chicago Blues Camp for Kids, 1 p.m. to 5 p.m. Tuesday, July 11. •Navy Pier's Birthday party on Saturday. Opening ceremony is at 11 a.m. with Lakefront Swing and fireworks show at night. •Chicago Latin Jazz Festival starting at 3 p.m. Sunday, July 16. •Shakespeare in the Parks presents "Romeo & Juliet" for three nights. Shows start at 7:30 p.m. July 27-29. •Water Colors weekly live jazz at 7 p.m. every Wednesday from Aug. 2 through Aug. 23. •Noche Caribena, a special concert co-hosted with the Puerto Rican Arts Alliance, starting at 6 p.m. Aug. 13. •Sunset Yoga every Tuesday at 7:30 p.m.